'When you are you, you see things as they are, and you become one with your surroundings. There is your self. There you have true practice; you have the practice of a frog. 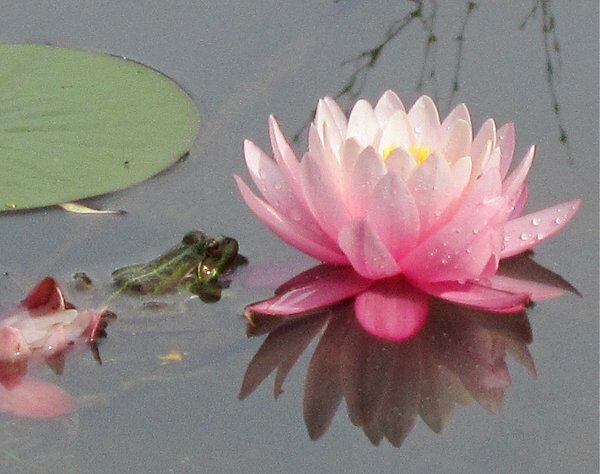 Here is a good example of our practice – when a frog becomes a frog, Zen becomes Zen. When you understand a frog through and through, you attain enlightenment; you are Buddha'. Those are the words of Zen master Shunryu Suzuki, and centenary celebrant John Cage was, of course, a Zen practitioner. My recent post The sound of 4’33” generated a large readership, doubtless helped by images of the stunning Zen garden at Venansault, France. When we came to view the photos taken by my wife at Venansault we found the one above that resonates synchronistically with Shunryu Suzuki’s teaching. For many Zen’s metaphysical obscurantism will be irritating, but the Buddhist tradition does contain much truth. Classical music is not an entertainment format, it is not a digital property, it is not a money spinner, it is not a social media toy, it is not a celebrity vehicle, it is not a mass market product, it is not a replacement for dub step, it is not a refuge for the ethically compromised, it is not a spectator sport, and it is not a higher art form beyond the reach of economic reality. Just as enlightenment awaits when a frog becomes a frog, so another form of enlightenment awaits when classical music becomes no more than classical music. And when that happens and we truly understand classical music through and through, many of its so-called ‘problems’ will be seen in a different light. More on John Cage, Zen and small sentient beings in Cleaning the ears of the musically educated. Zen is in in music and literary circles, but it's doubtful one of its most skilled, certainly its most aesthetic writers Suzuki (for someone who wasn't a poet) ever became a frog. So, when you become you you are enlightened? Prevalent on the spiritual path today is the notion that no change of consciousness is needed; you are there now and just have to realize it. Of course that's half true; but prey tell how do you become you? Who are you anyway? Who are you now that you aren't being now? If you can put that just be who you are in this present moment in ear-catching ways you attract a following, get invited to nice places where the hotel buffet is really great I imagine when my stomach prevents my mind from thoughts divine, and you don't have to worry about where your next meal's coming from or if you can pay the rent. Well, I'm sitting here in India on the spiritual path with a P3 computer and a jumble of net connection issues (not worried about eating at the moment, but it is a problem at times, rent more so), and I can't post this comment where I was originally trying to post one, after the latest Torres article, and I have to tailor it to this present post, and you are so contemporary aesthetic (enigmatic Zen?) I can't find any email address to send to you what I want to somehow get to him, and, putting my best foot forward, send you something to read that is not Zen you might be interested in. Go to the last writing on the page entitled Analog. Cage was a "Zen practitioner"? I'm not sure what that is supposed to mean, but Cage's engagement with Zen was not via a formal practice, as far as I know. In my haste I made the mistake of confusing two Suzukis. My comment was about D.T. Suzuki, one of the bringers of Zen to the West, a translator of ancient texts, the author of many essays, several books, including Zen and Japanese Culture (an excellent read). How presumptuous of me to make such a statement about the master Shunryu Suziki. The beginner’s mind, that no-idea, has found its way into many needed places, namely my own mind, as a medicine I still take since the illness has not been cured. Maybe he was a frog or perhaps kissed one and turned it into something royal. To speculate on another’s enlightenment when you’re not is unwise, unless they’re in your face making that claim, and you just don’t see their attainment. In a way, it’s like that for me with Zen. If you’re a Westerner on the spiritual path and at the same time a reader of your culture and what it’s saying about the said path, the path itself not the religious debate so dominate now, you get a lot of Zen. As a poet I’ve faced the problem. Below is a small excerpt from long poem written as a two-way conversation between me and Zen. It’s unpublished, non- literary, but if you put on that beginner’s mind, you mind find it’s tolerable to read. Zen is self-worth on the unknown. Zen is no concept to get across. Zen is no partial perception. I don’t understand your purpose. This is all for enlightenment. Zen does not dance angels on the head of a pin. But it’s not time to reduce it. It’s time to clean whistle around environments. It’s time to stop stabbin’ in the dark. You put out the process player. There’s no form to your order. It doesn’t pick up the clothes. You have a large idea and go to sleep. How do you criticize the wall for being still? Donny Duke emails to say he has changed the title of his poem to Like Which Life Squares? I do appreciate the acknowledgement that, whatever it's artistic merit, a poem was put in your comment section. However, the change in title is in regards to a prose writing I included a link to in my first comment, called then Analog, which isn't a poem but a comment itself I didn't post on the blog I was replying to and instead did on my own site as one would an article or an essay. It's remained a comment almost as a tongue in cheek way of getting published or posted, since as a piece of writing it's now on its way wherever. It so happened that here was the first place it landed, and after spending some time on this site and finding some nice stuff, a good appreciation of music mixed with enlightenment and other things that matter, the world through that wide lens set on infinity, I'm happy it was here, however successful that comment might be in its flight.